Everyone gets sick at some point in his or her lifetime … often many times! Illness is probably no stranger to your kids. In today’s Bible story, Naaman—a commander for the Syrian army—was really sick. He had leprosy, a skin disease that was likely disfiguring and isolating. Without a cure, Naaman would face great suffering. But help came from an unlikely source: a young slave girl. The people of Israel and Syria were often at odds with one another. The Syrians sometimes attacked the cities in Israel and plundered them. They took what they wanted, including people to work as slaves. The young slave girl who served Naaman’s wife had been taken from her home in Israel. As an Israelite, the girl knew about the one true God. She was familiar with God’s prophets, including Elisha, who had performed miracles to help and heal people. The girl told her mistress that Elisha the prophet could heal Naaman. So the king of Syria sent a letter to the king of Israel, asking him to cure Naaman of his leprosy. But the king of Israel had no power to heal Naaman. The power to heal comes only from God. Elisha called for Naaman. But what happened next was not at all what Naaman expected. Naaman expected Elisha to call upon the name of God, wave his hand over Naaman, and miraculously heal him. Instead, Elisha instructed Naaman to go wash in the river. Naaman was upset! He could have washed in a river back home! But Naaman’s servants urged him to wash. He did, and God healed him. Naaman was sick with a skin problem. His disease went away when he trusted God’s instruction from Elisha and washed in the river. All people have a sin problem that leads to death. We all need a Healer. When we trust Jesus as Lord and Savior, God forgives our sin and heals us. Help your kids understand that not all sick people will be healed on this side of heaven, but our physical maladies are symptoms of an even greater illness—sin. Jesus’ death and resurrection provided healing—forgiveness and eternal life—for those who trust in Him. Jesus heals people who are sick. God healed Naaman’s skin disease. 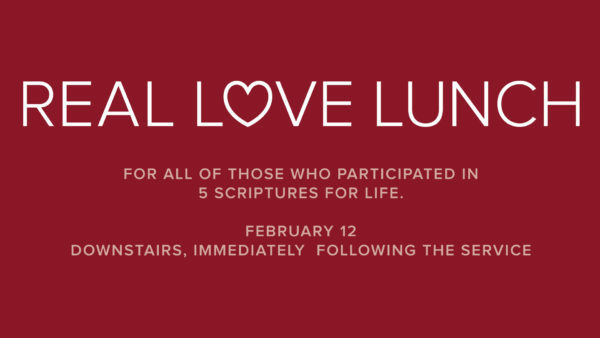 5 Scriptures for Life & Real Love Lunch – If you’ve memorized come for a “lovely” FREE lunch. If you haven’t memorized- donate to BGMC for lunch. LCC’s ❤for missions giving and drawing from valentine table is Sunday February 12th during Real Love Lunch. Thank you to all who have filled our heart box!